Based in Lymington, John Claridge has a distinguished record as a racing dinghy helmsman, boat designer, and boat builder. He is perhaps best known for his International Moth designs which in 2011 were named as “most iconic dinghy of all time” by Yachts and Yachting. 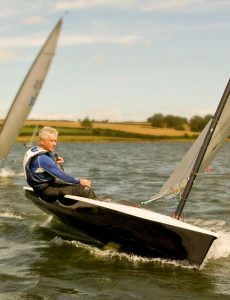 In more recent years he has revitalised the Lymington Scow, introduced the Lymington Pram, and promoted the Lightning 368 – as well as maintaining interest in the British Moth and the International Moth. 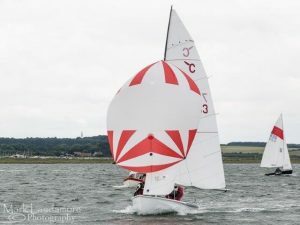 With the retirement of Tony Longworth the Seafly could have continued to fade away, but boat builder John Claridge and sail maker Pete Sanders were looking for a fast boat to race, which would recapture the old buzz of sailing an International Moth. Whilst there are many great new designs which could of worked for them, they needed a boat which John could build and Pete could make sails for. Seeing an advert for the moulds they remembered the Seaflys coming to Lymington in the 60s and not only often out performing the Ospreys, but being one of the few boats which could give the Moth a run for its money on a reach. Having done the deal for the moulds and a stock boat, even they were surprised by the performance and sheer joy of sailing it, and felt that with a more modern deck layout, it could still appeal to a lot of people. 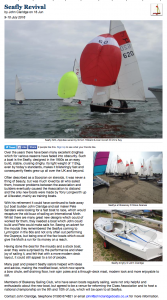 Many past and present Seafly sailors helped with ideas and advice, making the modified boat, which now sports a bow chute, self draining floor, twin spin poles and a through-deck mast, modern look and more enjoyable to sail. John Claridge took the new Seafly at Blakeney Sailing Club, where Seaflys are still regularly sailed. Club members were not only helpful and enthusiastic about the new boat, but agreed to be a venue for reforming the Class Association and hosted a Seafly National Championship during July 2016.